Nearly ten percent of the population of the United States has diabetes. When left untreated or mismanaged, diabetes can result in serious complications and premature death. Auburn Village has experienced nurses to provide help with all aspects of managing diabetes including: blood glucose monitoring, insulin administration and tracking, exercise plan, menu planning, education and more. There are two main types of diabetes, called type 1 and type 2. Both affect a person’s ability to produce and use insulin, the hormone that controls glucose (sugar). Diabetes causes a buildup of sugar in the blood and leaves your cells without the fuel they need. 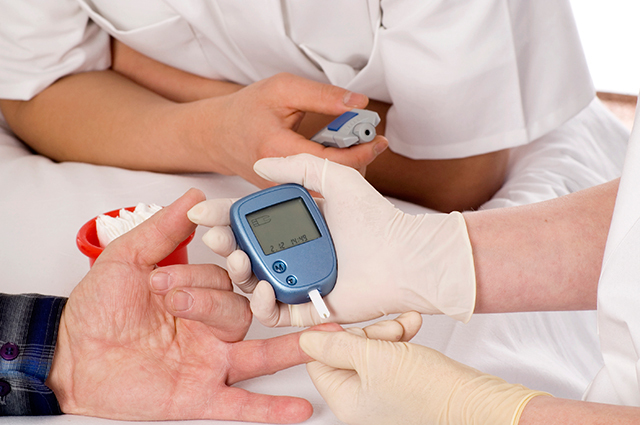 Over time, high blood sugar levels can damage blood vessels, eyes, kidneys, nerves and heart. Type 2 Diabetes: With type 2 diabetes, your body doesn’t make enough insulin or the cells are unable to use the insulin that is made. Type 2 diabetes can be treated by diet, with pills and/or many people with type 2 diabetes also take insulin. Your prescribed plan of care will include how often your blood sugar needs to be monitored, what medications will be used to treat your diabetes and with a healthy diet. Why Choose Auburn Village for Diabetes Management?